Christians have been celebrating Lent — in some form or other — since the earliest days of the Church. And this Lenten period of fasting and penance has always been somehow related to the holiest days in the liturgical cycle: The three-day Paschal celebration of Holy Thursday, Good Friday, and Easter Sunday. And the center of that celebration is the Cross. In carrying the cross, Jesus takes upon himself the sins of the world. In obediently and lovingly dying on the cross, Jesus atones for those sins. In rising again from the dead, Jesus makes the sign of the cross into the banner of his everlasting victory over evil. The Cross was absolutely central to Christ’s life and mission. And so, it must be absolutely central to the life and mission of us Christians. Why did God make the Cross so central to his Son’s life? Why did God make the Cross so central to our lives? And how can we carry our crosses as courageously and fruitfully as Jesus carried his? When we look at the crucifix, is this beautiful humility what we see? When we look at the crucifix, do we let ourselves be amazed by God who goes to such extremes to ransom his rebellious sheep? When we look at the crucifix, do our hearts fill with gratitude for such a gift? 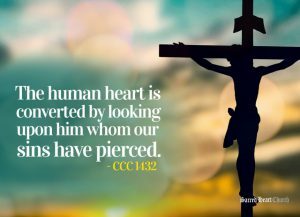 When we look at the crucifix, are we moved to repent from our self- centeredness and arrogance and to follow Christ’s example of loving humility? Let’s take some time now to gaze at our Lord on the cross, to meditate on the first color of the Cross, the brown, earth-color of absolute humility, which opened the door of hope and laid the groundwork for our salvation. When was the last time I looked at a crucifix and thanked Jesus for what he did for me on that first Good Friday? What do I usually think of when I look at the crucifix? When Jesus was dying on the cross, he was thinking of me — as the Catechism puts it “Christ did not live his life for himself but for us” (CCC 519). What was he thinking? If he could have spoken to me from the Cross, what would he have said? Converse with him as he hangs there, opening your heart to him, and letting him open his heart to you.